11-12 August 2012 - Richmond, VA - The PPA National Tour ventured to the sprawling and immaculately-maintained Richmond, VA Putt-Putt Fun Center to contest the fourth event on the 2012 PPA National Tour schedule, the two-day, 108-hole PPA Eastern Open, hosted by the Virginia PPA Tour. Host PPA professional, PPA Hall of Fame member, and course manager Gary Hinshaw and his staff worked diligently in the months preceding the event to prepare course # 2 for the tournament. With the highly-favorable course conditions, pundits of the sport anticipated prior to tee-off that the all-time six-round PPA scoring mark of 136 could be challenged. However, Mother Nature stepped in to help protect that record. Heavy overnight showers on the nights preceding each day of competition gave way to heat and beating sunshine on the tournament days. As a result, players continually were forced to hypothesize as to proper adjustments for tee positions, aiming points, and speeds for the course's twelve or more bank or multiple-bank shots. Nevertheless, a tightly-fought, low-scoring battle ensued near the top of the leaderboard. Prior to this season, Matt McCaslin, despite having won three-career USPMGA U.S. Open titles, had spent much of his playing career in the Brobdingnagian shadow cast by his highly-accomplished older siblings, David and Danny. But the 40-year-old bartender from Holly Springs, NC entered 2012 rejuvenated and with a renewed dedication to tournament competition. With some critical off-season equipment and swing tweaks and an enviable practice ethic, McCaslin immediately saw positive results, as he won two of the three 54-hole opening-weekend PPA Southern Tour events in Augusta, GA in a star-studded field to notch his first two PPA professional wins. McCaslin's third-career victory would be even more monumental, as he fired rounds of 21, 24, 22, 27, 25, and 21 for a 108-hole total of 140 to capture the PPA Eastern Open by two strokes over fifth-round leader Rick Baird. The triumph was highlighted by McCaslin's dramatic acing of the first fifteen holes of the final round. "It was the kind of course on which a player could get hot," noted McCaslin following the tournament. "With losing my lead going into the last round, I was focused on making a move and was able to run in the first fifteen (holes)." Action began with McCaslin soaring to the top of the opening-round leaderboard with what would inevitably become one of four tournament-low rounds of 21 fired in the event. 2007 PPA National Champion Baird stood alone in second place at 22. A three-way, third-place tie at 23 included 2000 Great Lakes Tour Champion Rick Alessi, reigning PPA Senior National Champion Ken Hastings, and 2012 PPA National Champion Greg Newport. With a second-round 22, Alessi maneuvered into a tie for the 36-hole lead at 45 with McCaslin, who shot 24. Two-time PPA National Doubles Champion Nate Nichols carded 22 to jump into a third-place tie with Newport at 46. Baird, 2011 PPA Western Open Champion Frank Warren, Hastings, and 2010 Great Lakes Tour Champion James Weber held joint fifth position at 47. McCaslin stormed back into solo possession of the lead with a third-round 22 to establish the overnight lead at a spectacular 54-hole total of 67. Richmond local stalwart Manfred Stewart and 2006 PPA National Champion Brad Lebo each also shot 22 in the third round to enter the final day tied for second place with Baird at 71. 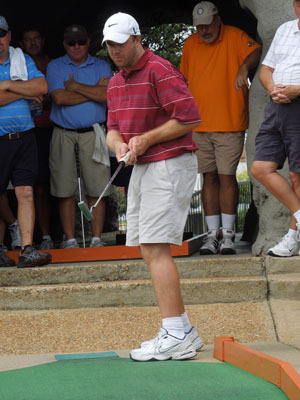 A gaggle of players tied for fifth position at 72 included PPA Hall of Fame member Bill Kirby, Alessi, Newport, and 1997 PPA National Champion Randy Reeves, who matched McCaslin for low-round honors for the event with his third-round 21. Another six contestants hovered at 73. Following heavy early morning rainfall, players were greeted on the final day of competition by overcast skies and saturated carpets. As the 9:00 a.m. Sunday tee-off time approached, however, beating mid-summer sunshine scorched the course, leading to tricky transitional carpet conditions throughout the closing three rounds. McCaslin commenced the day with a lackluster fourth-round 27 but clung to the lead with a 72-hole score of 94. Baird and Lebo each posted 24 to creep within a stroke of McCaslin's lead, tied for second place at 95. By virtue of a fourth-round 23, PPA Hall of Fame legend Daryl Freeman jumped into a tie for fourth position at 96 with Kirby and Newport. Baird forged a stellar fifth-round 22 to overtake McCaslin at the top of the 90-hole leaderboard with a five-round total of 117. Continuing his torrid second-day pace, Freeman carded 22 to move into second place at 118. With a fifth-round 25, McCaslin precipitated into a third-place tie at 119 with Lebo, who posted his second-consecutive 24. Nichols crafted a penultimate-round 22 to join 2008 PPA National Champion Kevin Lacey, reigning PPA Southern Open Champion Danny McCaslin, Warren, and Kirby in a tie for fifth position at 121. Baking sunshine and increasing afternoon winds in the final round provided a perplexing challenge to some in the field. But despite the tricky transitional conditions, action became heated in the final pairing. McCaslin recorded a perfect "9" on the outward nine to regain a share of the lead with Baird, who fired 11 on the front nine. McCaslin continued the final-round fireworks during his march to the clubhouse, surging back into sole possession of the lead by acing the first six holes of the inward nine. McCaslin's ace streak was stopped at fifteen, however, as his birdie effort narrowly missed on the 16th hole. With an untimely bogey on the 17th hole, McCaslin's advantage over Baird was cut to a single stroke. But when Baird's tee shot failed to fall in the cup on the oft-fickle 18th hole, victory was all but assured for McCaslin. McCaslin put an exclamation point on his first-career PPA National Tour title with a final-hole ace to finish off a brilliant closing-round 21, post a 108-hole total of 140, and collect the $750.00 winner's check. Baird settled for runner-up honors at 142. Nichols clawed his way into third place at 144 with an inspired sixth-round 22. Stewart also fired 22 in the closing round to finish fourth at 145. Deadlocked in fifth position at 146 were Freeman, Lacey, Danny McCaslin, and Warren. Lebo struggled to a bogey-free final-round 28 to drop into a ninth-place tie at 147 with PPA Hall of Fame member Greg Ward, who charged the clubhouse with a closing-round 22. Kevin Rutledge split low-round honors for the event with McCaslin and Reeves with his last-round 21. The final of the 27 money spots awarded in the professional division fell at a 108-hole score of 154. Matt McCaslin, Stewart, Lacey, Kirby, Johnson, and Alessi accepted the six spots offered to the top Six finishers in the 2012 PPA Eastern Open who did not already earn such a spot in the 2012 PPA Western, Southern, or Northern Opens for a free entry fee into the professional division of the 2012 Tournament Players Championship to be held during the PPA National Championship week. In the amateur division, highly-decorated APA veteran Donnie Carpenter, who returned to amateur division competition just several months earlier after a lengthy hiatus from the sport, dominated the amateur field en route to an emphatic wire-to-wire three-stroke victory. The drywall contractor from Hickory, NC fired rounds of 22, 24, 22, 22, 26, and 26 for an impressive 108-hole total of 142. Carpenter adds the win to his collection of National Tour major APA titles from the 1990's, during which time Carpenter established himself as one of the titans of the amateur ranks. 2010 APA National Player of the Year Randal Smith used a sizzling fifth-round 21, the low round of the event in the amateur division, as a springboard to a second-place finish at 145. A four-way tie for third at 147 included defending APA champion Dr. Chris Chafin, 2008 APA National Doubles Champion Mike Matthews, former Richmond, VA local standout Scott Anderson, and 2010 APA National Champion Joey Graybeal. The last of the sixteen amateur division expense reimbursement spots distributed in the event came at a six-round total of 162. The PPA National Tour membership extends its thanks to Gary Hinshaw, his wife Patsy, and their staff for graciously welcoming the tour to their facility for a very successful tournament weekend. The tour also greatly appreciates the extensive efforts made by Hinshaw and his staff to prepare the course and facility for the PPA Eastern Open. 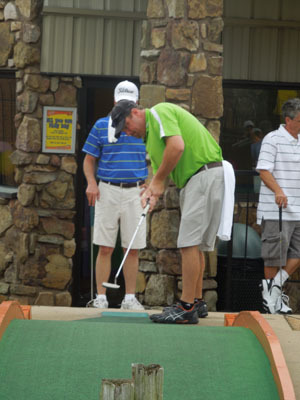 The PPA National Tour will return to action at the Columbus, IN Putt-Putt Fun Center for the events of the 2012 PPA National Championship week from September 11-15.